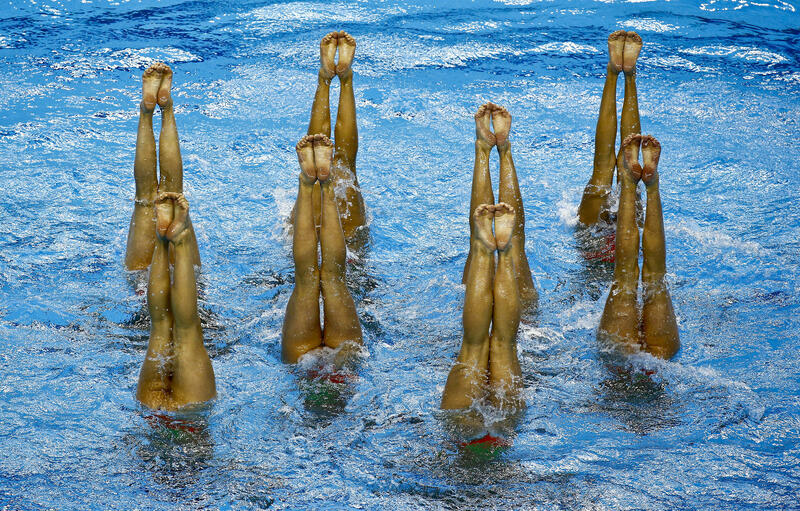 Team Switzerland competes during their synchronized swimming free routine team final at the 1st European Games in Baku, Azerbaijan. This month the first-ever European Games kicked off with a $95 million opening ceremony at a newly constructed 68,000-seat Olympic stadium. Hosting the event is energy-rich Azerbaijan, a former Soviet republic wedged between Russia and Iran, whose outlay of billions of dollars has garnered a lot of positive and negative publicity. Yet questions remain whether these European Games are the beginning of a new international tradition or a flash in the pan as so far no other country has said it’ll carry the torch to host again in four years. Azerbaijan certainly pulled out all the stops during the opening ceremony at the brand new Olympic Stadium. The show featured 2,000 volunteer performers in a tight display of choreography, fireworks and a special appearance by Lady Gaga. Not surprisingly the decision to hold a European sporting contest at the far-edge of Europe has caused a lot of head scratching. But the reasoning is pretty simple: Azerbaijan was the only country willing to fork over billions of dollars to fly in, host and feed some 6,000 athletes from 50 countries. The European Olympic Committees has also taken flak for awarding the games to a country that international organizations complain has a dismal human rights record. The EOC says it can’t control how a country treats its people – or foreigners – and has been on the defensive since Azerbaijan denied accreditation for the games to several European news outlets and barred delegations from Amnesty International and Human Rights Watch from crashing the party. Critics say that Azerbaijani President Ilham Aliyev – whose family has run the country since 1993 – have engineered the European Games into a stage-managed publicity coup for the country. The sales pitch seems to be working. And officially, everything here this week has been going swimmingly at the brand-new 6,000-seat Baku Aquatics Centre. The European Games are being called the Olympics of Europe yet many of these events, like aquatics, won't decide who goes to the Summer Olympics next year. There are already established qualifiers for swimmers and divers hoping to get to the Olympics. Philippe Jaccard, an accountant from Geneva whose daughter is here, is one of the many proud parents and family in the stands; he says Azerbaijan has done a fantastic job. "It's a good thing that they took this (on). I knew something about Azerbaijan, but very, very little. And this make me open my eyes to this country," Jaccard said. "People are free, people help you in the street when you're lost. There is no aggression, nobody steals from you. It's incredible. I was very surprised." And it is a beautiful show. The lawns are manicured, monuments are polished and thousands of uniformed police stand along long boulevards to reassure foreign visitors. But will Europe’s own Olympics be an expensive once-in-a-lifetime pageant or are the European Games here to stay? That’s been the question ever since The Netherlands pulled the plug on its commitment to host the 2nd European Games in 2019. The government said it didn’t want to spend the money. That disappointed many in the country’s athletic community who say they hope the games will live on. Perhaps. But the people who follow these things say Azerbaijan has set the bar pretty high for the next bidder. A lot of the success of course will depend on television ratings. According to our own very unscientific poll – which involved calling a handful of sports bars in European cities – it appears the games aren’t exactly generating a lot of buzz around the continent. In The Netherlands, bar manager Jeroen Van de Ven at Not Out in The Hague said he knew all about the European Games but his staff hadn’t been impressed. And at a sports bar in Berlin the bartender was initially puzzled by the question, but said he’d be happy to put it on the screen if anyone wanted to drop by.